I am grateful to Wipf and Stock for a review copy. In Women and Worship at Corinth (2015; see my review here), Lucy Peppiatt argued that certain passages in 1 Corinthians relating to women and order in worship juxtapose Corinthian quotations or slogans alongside Paul’s own thoughts. According to Peppiatt, 1 Corinthians 11:4-5b, 7-10, 14, and 14:21-22, 34-35 are Corinthian stances Paul is quoting as part of his counter-argument to defend and endorse women in positions of ecclesial leadership and participation in worship. Peppiatt’s approach is compelling and insightful, deserving, in my view, wide dissemination and engagement. Peppiatt has now published Unveiling Paul’s Women, a ‘shorter, simpler version’ (p. xiii) of her case as it relates particularly to 1 Corinthians 11:2-16. The first half identifies the various issues, oddities, and contradictions raised by a plain reading of these verses, explaining how and why it is plausible to read this passage as containing the Corinthians’ own suspect theology. The second half explores 11:7-10 (‘image and glory’) and 11:3 (‘head’) in more depth, and concludes with a helpful chapter demonstrating that Paul’s thought in 1 Corinthians 11 coheres with his overall theological vision of reconciliation in Christ. As a clear introduction to 1 Corinthians 11:2-16 and as a defence of Paul, Unveiling Paul’s Women is an unqualified success. Each chapter is divided into several brief sections, allowing readers to process each step of the argument without losing the thrust of the whole. Not everyone will appreciate this approach, but I do feel it models a way for how popular-level theology could be written. The least satisfying aspects of the book lie in some of Peppiatt’s finer discussion: so far as I could tell, she does not explain why the Corinthian leadership used image and glory (11:7) rather than image and likeness (Gen 1:26—assuming, of course, that the allusion to the first Genesis creation account is valid), and she does not offer anything substantial about how to understand Paul’s threefold use of kephale (‘head’) in 11:3. However, I emphasise that I found these two aspects the least satisfying—it would be difficult to claim that these weaken Peppiatt’s overall position. I have no hesitation in commending Unveiling Paul’s Women. Indeed, I would go so far as to say that anyone in Christian leadership, broadly construed, should read this book, especially if they would find it difficult to read the longer, more detailed, Women and Worship at Corinth. 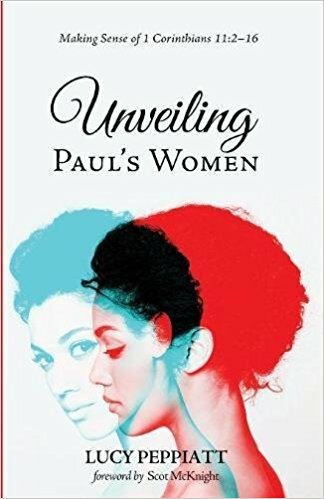 Those who have already read the earlier book should find it worthwhile to read Unveiling Paul’s Women, too, insofar as it takes into account responses to Women and Worship at Corinth and more recent Pauline scholarship, and offers glimpses into how 1 Corinthians 11 could be preached on or taught in a local church context.